It’s an exceptionally rewarding, and also challenging, time to be practising science. Science has never enjoyed the level of public interest it does today thanks to rising education levels and that wonder of the modern age known as the internet. With a couple of clicks of the mouse, or swipes of the touch screen, personalised science news is delivered via aggregator sites or outlets like Facebook, Twitter, Tumbler and Reddit to your desktop or personal device. On top of this, gold standard Open Access publishing has made research freely accessible to anyone in the world who has a connection to the internet. Scientists also find themselves increasingly under the watchful eye of organisations like Retraction Watch and from scientists themselves examining how science is conducted and its impact on the wider community. We need to be vigilant because fraud is on the rise, with the growth of Open Access publishers over the past few years seeing a spike in the retractions of dodgy or outright fraudulent research papers. Then there’s the backlash against science from educated and financially well off sectors of the community who have lost trust in it and refuse among other things to vaccinate their kids or to drink fluoridated water. There’s a wider theme here as well especially in the West. People have lost confidence in authority – in the political, legal, medical, scientific and religious institutions that have been at the core of our society for a century or more. And then there’s the narrative about progress and prosperity that has pervaded our economic development since the eighteenth century. Science has found itself a central player in this story, yet so many people feel badly let down by it, especially since the global financial crisis of 2007-08. Part of the solution to rebuilding community trust in science is through scientists embracing greater openness to the wider community. Engaging in a more mature conversation about how and why ideas change, and how changing our minds is not only a good thing, it is science working at its very best. Through a willingness to embrace ‘warts and all’ discussions about the human element in science. Open dialogue about the motivators and incentives driving individual scientists and the institutions where it’s being undertaken; and their consequences, good and bad. For us to be prepared to discuss the implications of government dabbling in science, which too often builds in perverse incentives that run counter to the best interests of science and the welfare of the people practising it. Through us demanding greater honesty from the media about the complexity of the ideas and findings we scientists wrestle with, the dynamic nature of scientific theories and the process of discovery. The very contestability of knowledge itself. People are smart; they will get it, and enjoy it. Despite the impressions created otherwise by mainstream media outlets. One wonderfully insightful way to do this is through telling stories about where and why science has gone horribly wrong, and how it was found out, and things set right. The most famous example in anthropology is the Piltdown fraud, a dramatic episode in history that ran from 1912 until 1953, a remarkable 41 years. The Piltdown fossils were discovered in 1911 (or perhaps 1908) and again 1915 in a gravel pit at Piltdown in Sussex, England. Most of them were found by Charles Dawson, a well connected local solicitor and amateur antiquarian. The gravel deposit at Piltdown seemed to be of great antiquity as revealed by other finds, including teeth of a mastodon, a stegodon, a beaver, and a hippopotamus, as well as flint and bone tools. Dawson wrote to Arthur Smith Woodward, Keeper of Geology at the British Museum (Natural History), to alert him to the finds and their potential significance. The bones were reconstructed by Smith Woodward and his assistant Frank Barlow to form a single partial skull, and they revealed them to a packed meeting of the Geological Society late in 1912. 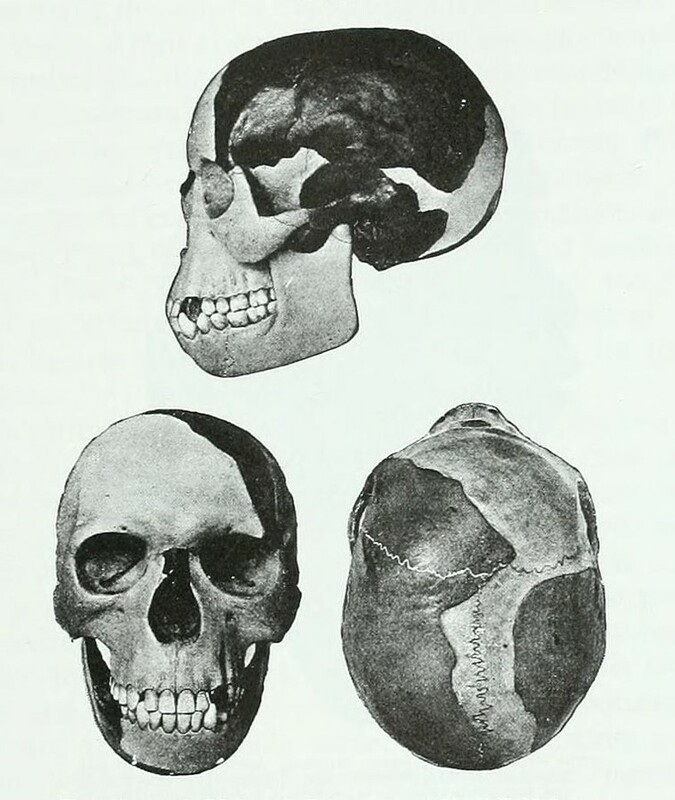 Smith Woodward proposed to name the skull Eoanthropus dawsoni (“the dawn human of Dawson”) in honour of its discoverer. Other remains were found later by the Jesuit priest and eventual professional archaeologist Teilhard de Chardin, as well as by Dawson, at other localities some distance from the Piltdown quarry. The timing of the discovery couldn’t have been better for British science. The leading anthropologist Grafton Elliot Smith, an Australian living in England, was already arguing the earliest humans must have possessed enlarged brains: the principal feature that today distinguishes us from other apes. With its combination of a large modern brain and primitive teeth and jaws, the find sat perfectly with Elliot Smith’s expectations, and this led to the rapid acceptance of the find by every prominent British anthropologist of the day. With hindsight it’s hard to imagine how they could have been so easily fooled. Some of the greatest scientific thinkers of the time had suspended disbelief and readily embraced a fossil that should easily have been recognisable as a fraud. What was remarkable about it was that it deceived many scholars for 40 years before the hoax was uncovered. What was evil was that the imposture was a major factor in holding up the advance of a branch of science, palaeoanthropology, for over a quarter of a century. The Piltdown fraud delayed the acceptance of Africa as the evolutionary birth place for humans by decades, instead leading science down the blind ally that was Europe. And it almost destroyed the careers of several scientists working in Africa, whose discoveries were among the most important ever in the history of anthropology and set the stage for the contemporary field of human origins science. Scientists such as Australian Raymond Dart living in South Africa, who discovered the revolutionary Taung child; Robert Broom who found Mrs Ples near Johannesburg; and Louis and Mary Leakey whose work in East Africa revolutionised palaeontology and archaeology. The fraud was only revealed in 1954 after detective work done by the South African anatomist Joseph Weiner, British anatomist Wilfred Le Gros Clark and British geologist Kenneth Oakley. A year earlier Weiner had viewed the Piltdown skull for the first time at a conference held in the rooms of the Geological Society of Great Britain, and in this first viewing of it he came to the unsettling conclusion it was a fake. Their work showed through various chemical tests that the Piltdown skull was geologically too young to be an early human ancestor. They also showed its teeth had been filed down to enhance the appearance of antiquity. The Piltdown skull was a composite of an orangutan jaw and two human skull bones, carefully broken, filled with gravel, and painted to resemble a fossil. Six years after they exposed it as a fraud, radiocarbon dating on the bones revealed they were no more than 600 years old. Attention quickly turned to identifying the perpetrator of this evil deed, and fingers were firmly pointed at Charles Dawson. Even more astonishing, 12 suspects were implicated in the hoax after it was exposed, some of them at the very top of the British scientific and cultural establishment. Among them were Teilhard de Chardin, Arthur Smith Woodward and his assistant Frank Barlow, Grafton Elliot Smith, Arthur Keith, a leading Scottish anthropologist, and William Sollas, professor of geology at Oxford. Some of the more intriguing suspects were Arthur Conan Doyle of Sherlock Holmes fame, friend of Dawson and passionate human evolutionist, and Samuel Allison Woodhead, a bacteriologist who had been consulted by Dawson on how to stain bones. But to this day, only Dawson remains fingered as the chief hoaxer, as revealed by a recent piece of modern day detective work led by investigators from the Natural History Museum and using DNA analysis. What motivates a scientist, or in this instance, an amateur scientist, to commit such a heinous hoax in the first place? It’s well recognised that the most important motivators for dishonesty and fraud come from the system of norms and rewards within science and the institutions in which scientists work. Some of them, such as intense competition, which has ratcheted up in recent years in the university sector, even make fraud inevitable. The main ones driving it are pathetically mundane, such as the desire for prestige, power or fame; sometimes innocuously described as ‘careerism’. This was the situation with the Piltdown hoax and is always the situation in contemporary cases. Openly discussing the history of science, where is has gone wrong, and the incredible efforts individual scientists go to uncover fraud should inspire confidence in its self-correcting nature. Sometimes it can take decades, but frauds are eventually uncovered, and the perpetrators either brought to account or their names permanently sullied in the annals of science. Thankfully, we can be confident in the knowledge that most scientists are genuinely driven by the personal rewards that come from doing science; like the sheer thrill of discovering something new. Previous Post Is it Back to the Future for Human Origins Science or Just a Case of Science Media Misleading us Again?